Racism, poverty, gangs and immigration rise to the top of social issues for some Buffalo teens. Buffalo Academy for Visual and Performing Arts students have been play-acting those issues for their production of West Side Story. It opens tonight on the school's Main Stage. WBFO's Focus on Education Reporter Eileen Buckley attended a rehearsal. Buffalo Academy for Visual and Performing Arts students rehearsing for West Side Story. 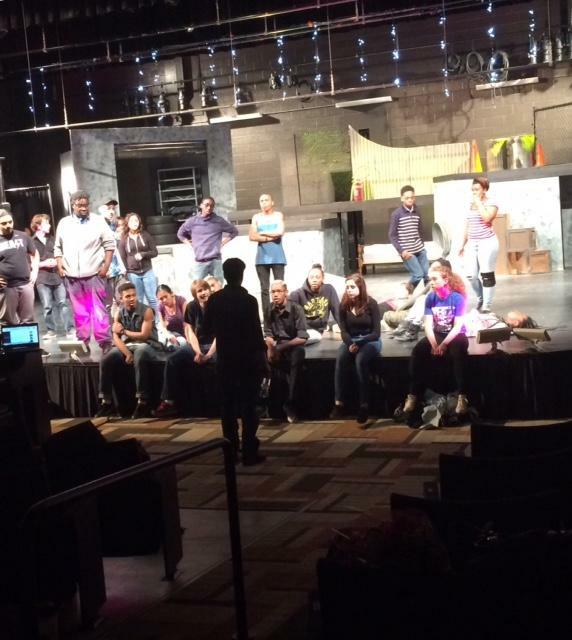 WBFO's Focus on Education Reporter Eileen Buckley attended a rehearsal of West Side Story at BAVPA. Performing Arts Theater Teacher Andrew Kottler stood on the edge of the school stage explaining what scenes they were going to run through. He's directing West Side Story with about 40-student performers. The musical is about two teens in a forbidden love. “It’s super important to us that we find shows that the kids really love, that they can really grab onto because if they’re engaged the show is going to be great, so the selection process is vital,” explained Kottler. West Side Story involves conflict and rival street gangs, the Jets, who are White and the Sharks who are Puerto Rican. “We’re lucky, we have a huge Puerto Rican population here and the Shark side is written for Puerto Rican actors, so that hits homes for them right away. Ironically the Jets are white, but we were able to use a mixed-race theme with them. It’s just, once again, the strengths of our school. We’re such an ethnically diverse school,” said Kottler. 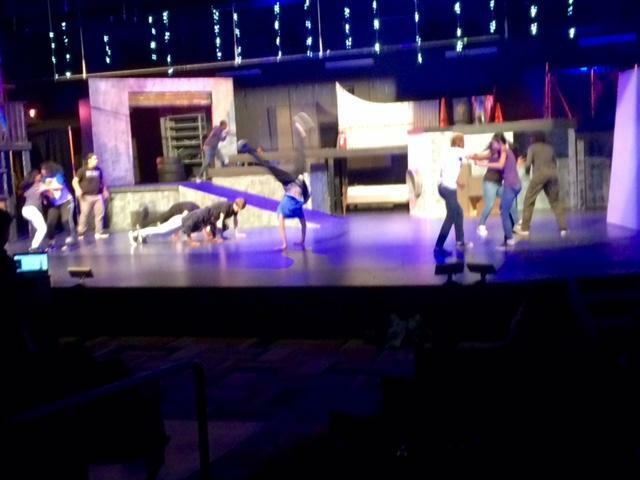 Students at Buffalo Academy for Visual and Performing Arts rehearsing for West Side Story. The play is about rage, power, fitting in and prejudice. The story was originally set in a New York City neighborhood in the mid-1950's. But Kottler tells WBFO News they customized their performance. “The originally musical, the movie is so iconic and it’s so not the direction we took it. Our kids are really edgy, real unique in their own way, very Buffalo, very urban Buffalo and we use their strengths, and we tap into their life,” explained Kottler. Students in the lead roles said they can compare issues in this musical to many the lives of Buffalo teens they know. Jacob Rodriguez is a senior. He plays the role of Bernado leader of the Sharks. "I know personal friends of mine who have been through violence, that have been even love story – not being able to show your love for somebody because you’re in the wrong gang. The violence – definitely – me growing up on the West Side – you know I’ve been around a lot of violent activity being there and it’s just amazing to see a story that was made a long time ago can still impact lives today,” replied Rodriguez. “I play Maria. I play the star of the play,” said Shanice Battaglia in a very excited voice. Battaglia is a senior. She said the gangs’ bigotry against one another is a directly link to tensions in today's society. “Can definitely related to someone’s life because it’s a war between whites and Puerto Ricans. It’s definitely emotional for me, but I feel like I can relate to it,” responded Battaglia. Carolyn 'Blaise' Miranda is also a senior. She is portraying Maria's best friend Anita. “A lot of us can resonate with the problems and we can relate to the bigotry and racism that is involved in this play, but the challenge, I guess in a way, is actually facing it,” replied Miranda. Miranda relates to the prejudice in West Side Story. “I come from Spanish decent, but I do look Caucasian, but a lot of my friends are – so I witness that more from them suffering and it hurts, but it is very well alive in our neighborhoods and where I grew up,” remarked Miranda. On stage the students dance with power as they display each character of this musical. Rodriguez, Battaglia and Miranda all described how excited they are to experience this play. They admitted it was stressful to sing, dance and act, but worth the experience they were gaining. “The final scene when I have to figure out if me killing the people who basically killed Tony, my boyfriend in the play and also my brother, I have to come to a decision that if that’s really me and the in the end, no, it’s not me and I just drop the gun. It’s extreme for me and really a big moment,” described Battaglia. “Oh it’s been a blast really getting to take on a dream role of mine that I’ve been waiting to do since I was a kid watching West Side Story,” said Rodriguez. “I felt really connected to her as in her personality. She was very fierce and she was confident and I was really, really drawn to that,” stated Miranda. For Performing Arts school play director Kottler it is the ‘most challenging’ musicals the school has performed, but he is very proud of how the students have evolved and mature through the experience and dealing with deep issues that West Side Story brings to an audience. “This is a real, life changing event for a lot of these kids,” Kottler responded.